We're back from what was probably our last European vacation for quiet some time, so we made sure to enjoy every second of it. Get ready for a very wordy post with lots of pics! We left SFO on Thursday afternoon to be surprised by our friend Chris (who we were going to visit) on the same flight! We thought he had left the day before (as he was in California interviewing the prior week). The 11 hour flight wasn't has bad as I thought it would be, minus the fact that we did not have the bassinet that we asked for from United on 3 separate occasions. We made it work, Lily screamed a few times here and there but for the most part she was great. We landed at 10am local time in Germany and Chris's wife Amy picked us all up and we drove to there house in Hutschenhausen, Germany right by Ramstein Air Force Base. They live in a super cute village that backs up to beautiful fields. The weather was beautiful and after a long flight we all decided to just relax outside, go for a long walk and let the kids play. We ordered Doner Kebob sandwiches for lunch...so good! Then Amy had a nice home cooked meal for us that night. Saturday morning Rollie and I were off to Paris, solo! Lily stayed back with the Downers while we took the 3 hours train into Paris. We took a short taxi ride to our hotel in the Latin Quarter, Hotel Le Clement. Perfect location, clean and somewhat spacious room for European standards. We dropped off our luggage and immediately headed to lunch. We walked about a 1/2 mile towards the Luxembourg Gardens and ate at upstairs at a cute little cafe called Au Petit Suisse. We both had versions of croque-monsieur, salad, and of course pomme frites (french fries). Rollie had a glass of Burgundy. Delish. We then walked about a mile and a half to the catacombs really hoping to get in before the last entrance at 4pm. No such luck. The let in everyone but us and the couple right in front of us. We were so bummed because it's something we didn't do in Rome and they were far away from everything else in Paris so we knew we would go back the next day. We decided to hop on the metro to Notre Dame, which of course did not disappoint. On our walk back to the hotel to rest and freshen up for dinner we passed a wine bar, L'Avant Comptoir that I had read a ton about and really wanted to try. It's a super narrow bar with the menu hanging on cards from the ceiling. No seats, only lined by two bars to stand at. We ordered two appetizers, a goat cheese Parmesan dip and ham croquettes. Rollie had a glass of wine and I had some sparkling water. All great. On our short walk back to the hotel we popped into a really cute wine shop, LeCremerie where Rollie bought a bottle of Burgundy to have in the room. We layed down for a bit before freshening up for dinner. We had so many recommendations but we also knew we wanted to stay close by because I couldn't walk much more! 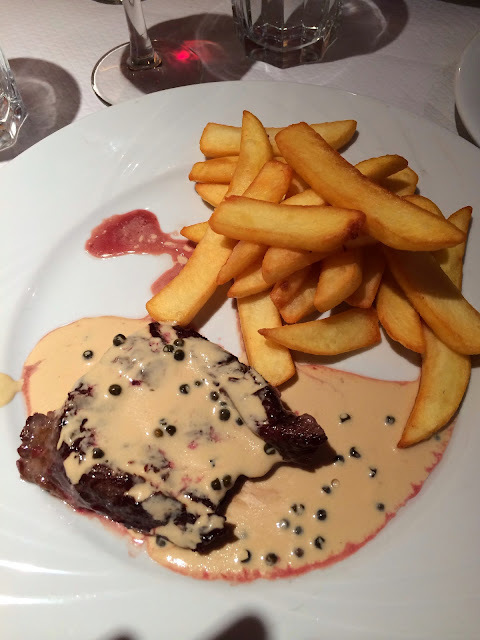 We actually found a great restaurant on Yelp called Le Bistro Du Perigord, 71 rue Saint Jaques in the 5th arr. It was 8:30 and empty which made us a bit skeptical but it was amazing. My only compliant was the lack of ambiance, a bit bright and we were sat under a big television. I opted for the warm goat cheese salad, steak aux poivre, and of course creme brulee. Both the steak and creme brulee were probably my favorites out of the whole trip. Rollie got a ham and cheese crepe, beef bourguignon, and a glass of Sauternes for dessert. His was all great as well. We shared (more Rollie than me) a 1/2 bottle of 2009 Bordeaux from Saint-Emilion. Our whole meal was only 50ish Euro, $78! Easily a $120 meal somewhere similar here. We rolled walked back to our hotel and slept like babies. If we thought we did a lot Saturday, we were very mistaken. Sunday we crammed in so much! We started the morning off with a small breakfast in our lobby, just your usual pastries, croissants, fruit, and coffee before walking over to the Louvre. On the walk over we crossed the Ponts De Arts or better known as the "lovers bridge". It's lined with locks that couples have left over the years as a token of their love. It was a beautiful morning at practically empty since we wanted to be at the Louvre when it opened at 9am. Just on the other side of the bridge stands the Louvre. Which just from the outside is a piece of art. Its so hard to believe that Louis XIV had the 652,000 square foot Palace as a home! We knew we could only spend about 2 hours there if we wanted to see everything else on our list so we stuck to a few halls and made the best of it. We went straight to the Mona Lisa which is small and underwhelming but the piece across from it was just incredible. We both like Egyptian and Greek Antiques so we made sure to see that and we also stumbled upon some of the Royal jewels which was really neat. After leaving we walked through the Gardens which are just as enormous as the Louvre itself. The gardens lead to Champs E'lysees, the Union Street or Michigan Ave of Paris. We had lunch first on the patio of Pizza Pino a chain of sorts but really good. Rollie had a glass of Rose and we shared a mozzarella bacon pizza. Yum. After lunch we shopped around a tiny bit but nothing special...mostly American brands. We popped into Laudree to see what all the buzz was about but it was too packed and neither of us like macaroons anyways. We glanced at the Arc de Triomphe from the street but opted not to go up it since we knew we were doing the Eiffel Tower that evening. We took the Metro over to Montmatre (the wrong way, but only for one stop before realizing it). As we got off the train we noticed an elevator, but didn't think much of it before walked up about 10 flights of stairs to the street level...now we knew what the elevator was for! Montmatre is beautiful, older, hilly, less traveled part of Paris. We shopped a bit and then walked (more stairs) over to Sacre Coeur, a beautiful Basilique. We snapped a few pictures and then headed towards Moulin Rouge which is in the red light district. Pretty fun to walk by all the risque shops. By this point we were both exhausted and I really had to pee so we popped into a bar for a beer and sparkling water before catching a taxi back to our room. We figured by that point we had walked about 8 miles. Before returning to our room we went to Paul, a bakery and stocked up on goodies and I got a delicious Nutella crepe from a little food stand. We took a nap before freshening up for the Eiffel Tower and dinner. We took the metro over to the Eiffel Tower which even the 2nd time around for me is just stunning. The line to take the elevator all the way up was super long and we were afraid to miss our 9pm dinner reservation so more stairs it was! We walked up 704 steps! Not feeling too bad about that crepe or bread by this point. It was extremely satisfying walking up vs. taking the lift. You can't walk the very last part so we took the elevator up to the very top. We only had about 5 minutes at the top before making the trek back down before dinner but it was totally worth it. 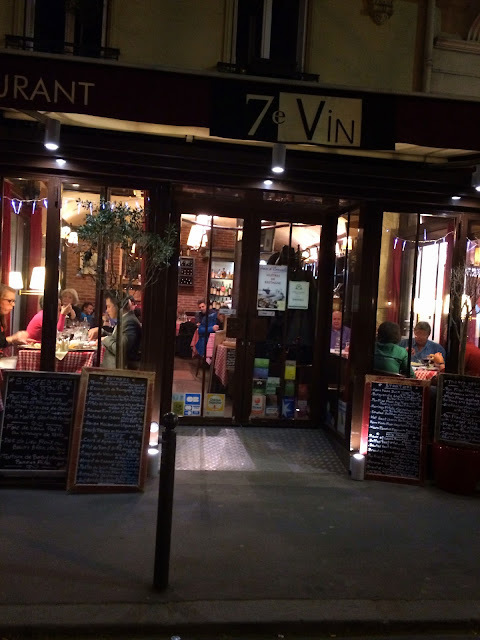 We headed about a 1/2 mile to dinner at 7eme Vin which was recommend to us by a friend of a friend. Everything was perfect. We shared a glass of Champagne and then ordered a bottle of Bordeaux from Chateau Dallau (which we took 1/2 of to Nice with us). 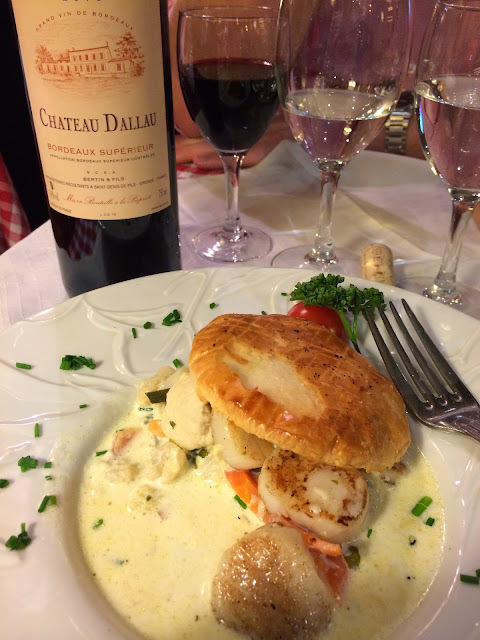 I started with a puff pastry scallop dish which was to die for! Then I had the lamb chops with mashed potatoes and Rollie had steak aux poivre. We were so full but did share a scoop of vanilla ice cream with chocolate sauce to top it off. The service was so friendly at this place and the atmosphere was true romantic french. The menu's were also on chalkboards (English on one side and French on the other) which was really nice. We cabbed it back to our hotel and passed out.